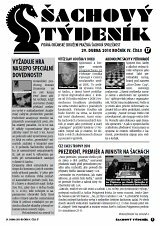 Civic Association, Prague Chess Society, has been publishing Chess Weekly for nine years. Any chessplayer can obtain a copy free of charge direct to his/her e-mail box. You only need to register on this webpage. 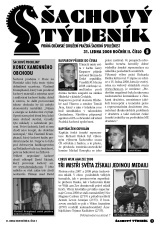 Chess Weekly is published in pdf format, usually consisting of 12 - 18 pages. It provides up-to-date coverage of current chess tournaments and also well commented Grandmasters games and articles from the world of chess policy, society and culture. Chess Weekly is published every Thursday evening, so you should have it in your e-mail box by Friday morning at the latest with the exception of one week during summer holiday and another week during Christmas, when we published coupled issue instead. You can either print out the magazine or you can read it directly on the screen. If you read it through internet you can use direct links to tournament or players webpages that we mention. In case you will not receive the magazine, it is most likely cost by your overfull e-mail box, or by your spam filter. All you need to do is to write to our e-mail address prazska.sachova@gmail.com and we will resend you the missing issue. Our magazine is open to all sorts of opinion and suggestions of our readership. We welcome all your reactions and suggestions, as well as your contributions that we either print as articles in their own right or in the Readers’ letter column. Any part of Chess Weekly must not be, without a prior consent of the publisher, published in a different magazine or publication (both in printed and electronic form), nor to be published in electronic form (for instance on webpages). Printed out issue can be hung on noticeboards in your chessclubs, so even those chessplayers without access to internet could read it. 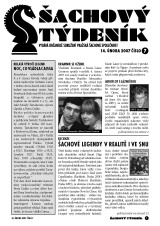 Chess Weekly is circulated for free, it is financed through advertising. Advertising price list can be downloaded below the registration form. We provide commissions for arranged advertisement according conditions predefined in contract. Commission may vary from 10 to 30 percents depending on total volume of arranged advertisement.